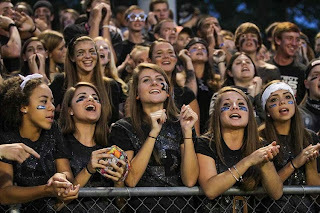 1) Atlee dispelled the myth of the Henrico Warriors, cruising to a 38-7 halftime lead en route to a 38-14 win on Homecoming night for the Raiders. Atlee moves to 3-1 with TD passes from Reid McCoy to Daniel Glymph and Austin Phipps. Henrico falls to 3-1. 2) Hanover went to war at home against former Capital District foe Highland Springs. PAT's were missed left and right, two fake punts, multiple 4th down conversion attempts and a very controversial call later, the Springers escaped with a 32-26 win. DJ Johnson threw for 184 yards and 2 touchdowns, running for a 3rd, while Alex Wilson scored the first and final touchdowns of the game. GAME OF THE WEEK NEXT FRIDAY: Hanover (2-2) at Atlee (3-1), 6:30pm on WHAN, 102.9 FM, 1430 AM and online HERE at HanoverCountySports.net. 3) Lee-Davis ran into a buzzsaw at Varina as the Blue Devils advanced to 4-0 with a 33-7 win. Tim Minor led Varina, including breaking off a 70-yard touchdown run. The Confederates fall to 1-3. 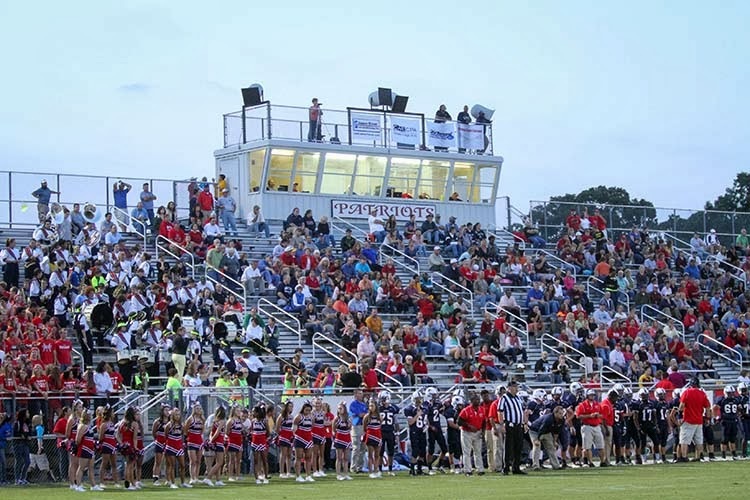 4) Patrick Henry's comeback attempt fell a Hail Mary short at home as the Patriots lost to Mills Godwin 28-20. Bender Vaught became the first Patriot rusher to crack the 100 yard mark on the season. Patrick Henry is still in search of their first win of the season, while Mills Godwin, after losing their home opener, wins their third straight on the road. Randolph-Macon football is on a bye week, so no action on Saturday. The Randolph-Macon women's volleyball team is participating in the Emory Tournament in Atlanta, Georgia. Women's Soccer goes to Sweet Briar for a 2pm game, while the Men's team plays at Emory & Henry at 3pm. Many county cross country athletes will participate in the Maymont Cross Country Festival Saturday morning in Richmond. Taylor Loomis, Ally Ritchie, and the R-MC field hockey team are home, hosting Bridgewater at 1pm. 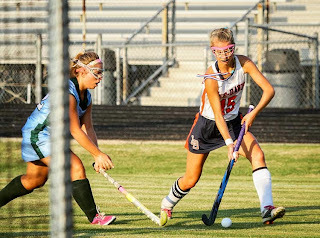 1) FIELD HOCKEY: Lee-Davis improved their torrid start to an 8-0 mark, scoring all of their goals in the first half en route to a 3-1 win over Glen Allen. Lauren Wolfgang had two more goals for the Confederates, one was assisted by Madison Doss, who scored their final goal just 85 seconds before halftime. The Jaguars got on the board in the second half, but came no closer than two. 2) VOLLEYBALL: Patrick Henry's boys team scored an important win at home over Mills Godwin in a game heard live on HCS Media Network. Sam Boyd's 38 assists set up Lucas Pienkowski, Austin Pace and Cowles McCray with important kills as the Patriots swept the Eagles, 25-18, 27-25, 25-20, to move to 8-4. The Hanover boys survived a marathon versus Glen Allen, winning the tiebreaking fifth set 18-16, and the Lee-Davis boys were victorious, sweeping Highland Springs on the Springers' home court. In girls' action, Atlee moved to 9-1 with a sweep of Varina, while Lee-Davis held serve at home, sweeping Highland Springs. Hanover fell to Glen Allen in three sets in a battle of former Capital District, and now Conference 20, foes. 3) WOMEN'S SOCCER: Randolph-Macon traveled to Mary Washington, but fell by a 4-2 count. The Jackets now have a record of 3-5. 1) CROSS COUNTRY: Patrick Henry meets J.R. Tucker and Hermitage on the road Wednesday afternoon, while Atlee, Hanover, and Lee-Davis all head to a "Capital District" meet at Pole Green Park. 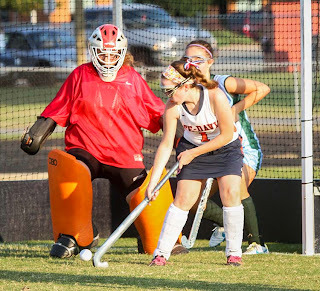 2) FIELD HOCKEY: All eyes will be on Atlee at 5pm as Hanover comes in to face the Raiders, who are coming off a shocking loss to Henrico Monday in penalty strokes. Patrick Henry looks for their fifth win of the year at home against Maggie Walker Governors School while the unbeaten Lee-Davis Confederates go for 9-0 at Varina. 3) WOMEN'S VOLLEYBALL: Randolph-Macon, winners of three straight ODAC matches, look to extend that streak in Crenshaw Gymnasium Wednesday night when Bridgewater comes to Ashland for a 7pm match. LIVE TWEETING: HCS will be at both the Hanover/Atlee Field Hockey match and the Bridgewater/Randolph-Macon Volleyball match at 5pm and 7pm respectively! 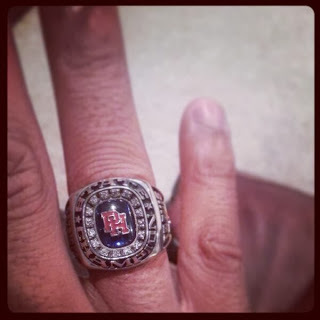 Follow us on Twitter, @hanoversports, for real-time updates from those matches and scores from other games!! 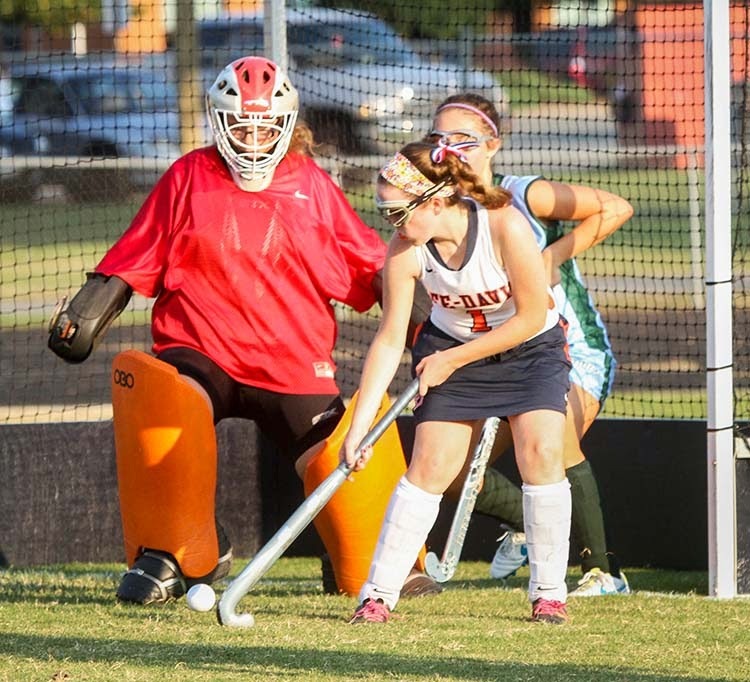 Field Hockey action in every corner of the county Monday night with some interesting results. The shocker of the night was at Atlee, where the Raiders (6-3) were upset by Henrico 3-2 in penalty strokes after a scoreless regulation and overtime. Numa Rehmani had 12 saves for the Raiders, who must regroup and be ready to face Hanover at home Wednesday at 5pm. 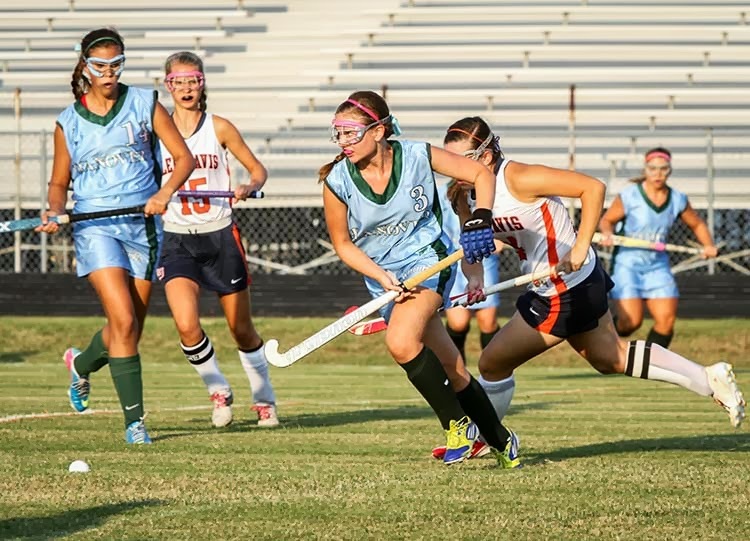 The Hawks dispensed of Varina 3-0, while Patrick Henry shut out J.R. Tucker on the road 4-0. 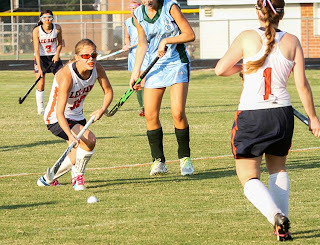 Meanwhile, Lee-Davis celebrated Senior Night with a 10-0 defeat of Highland Springs. Cameron Gibson had four goals and Madison Angus and Lauren Wolfgang each tallied one. The Confederates have a huge match-up tonight at Glen Allen. 2) Boys Volleyball: LIVE ONLINE coverage of Mills Godwin at Patrick Henry from HCS Media Network will begin approximately 6:45pm! Listen LIVE at HanoverCountySports.net! 5) At Randolph-Macon today, the women's soccer team travels to Fredericksburg to battle Mary Washington, game time 4:30pm. Through the monsoon went HCS to visit two Hanover County freshmen who have already made their mark in football and women's volleyball. 1) Sam Rogers played often, at tailback and on special teams as Virginia Tech won the first triple overtime game in Lane Stadium history, 29-21 over Marshall. 33 plays for Rogers by our count, most blocking, but QB Logan Thomas missed a wide open Rogers on a key fourth quarter pass. The Hokies, behind for over half of the game, finally tied things up with 3:09 to go on a TD pass from Thomas that was tipped before being caught in the end zone by Willie Byrn. Each team failed to score in the first two overtimes as the rain poured and the winds swirled. Thomas finally took the game into his hands, scoring a touchdown and the mandatory 2-point conversion in the third overtime. The Tech defense, stalwarts in the second half while the offense sputtered, stopped the Thundering Herd one last time to seal the victory. 2) We visited 89-year old Memorial Gymnasium on the campus of the University of Virginia next to see freshman Karlie Suber and the Cavaliers battle in-state foe William & Mary. The Tribe won the first set 26-24 before the Wahoos took the next three sets to win in four to advance to 7-5. Suber played in the first two sets and had six digs. Virginia gets ready for ACC play, having to travel to Duke and Wake Forest before returning to Charlottesville October 11th and 12th. Karlie is one of four freshmen active on the roster and getting a lot of playing time, and thus, key growth experience in weekend tourneys as the Cavs prep for the ACC. 3) Deshaun Rogers had two kick returns for 27 yards total and a solo tackle as Randolph-Macon outlasted Bethany (WV) College Saturday 36-28. Will McGhee had a monster game, rushing 42 times for 296 yards to lead the Jackets, now 2-1, who have a bye next week before starting ODAC play at home October 5th. Add in Donte Haynesworth's work on defense with Norfolk State, and the Class of 2013 is already making its mark at the next level, with many other athletes waiting in the wings come winter and spring. We'll have a wrap-up of this special Saturday tour in Thursday's Hanover Herald-Progress. Listen to both right here at HanoverCountySports.net from HCS Media Network! 1) The Blake Stattelman Show--The junior tailback rushed for 204 yards and three touchdowns....in the FIRST HALF! 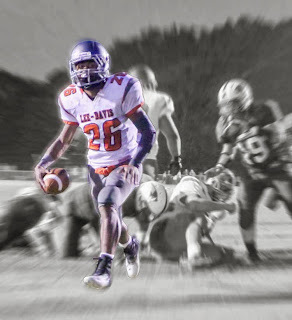 He returned to add 117 more yards and a final touchdown run to end the night with 42 carries, 321 yards, and 4 TD's, Player of the Week candidate without a doubt, as Lee-Davis beat Patrick Henry 34-14 in the 55th Tomato Bowl. It's the Confederates' 3rd straight Tomato Bowl victory, as well as their 3rd straight win in Ashland dating back to 2009. 2) PH Finally Scores, Now What?--Their defense, again, wore down, because the offense couldn't sustain drives. Tyler Phelps was quite rusty in his return, going 2-of-13 for 11 yards, though he had two long pass attempts to Chesdin Harrington right on the money before they were knocked away by Lee-Davis defenders in one-on-one jump ball situations. The Patriots are 0-3, and 2-1 Mills Godwin comes calling next Friday. PH desperately needs #1's to emerge: a number one tailback, a number one receiver, a number one shutdown defender who leads the charge a la Jeff Thompson, Sam Smith and Adrian Cavanaugh have over the past decade. That warrior-type leader hasn't emerged for the PH defense...yet. 3) Hanover, Atlee Go Down on the Road: Hanover jumped to a 13-0 lead, then sputtered the rest of the way, while Hopewell jumped back into the game with a great 3rd quarter, taking the lead for good late and holding on for a 21-19 win. The Hawks are 2-1 and return home to facing a rested 2-1 Highland Springs team, who had a bye this week. Highland Springs at Hanover is our Game of the Week on 102.9 FM WHAN Radio and here at HanoverCountySports.net next Friday! 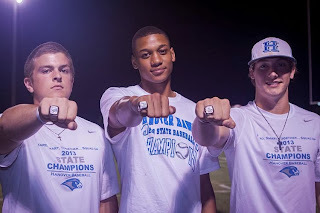 Atlee discovered they didn't have the only defense in the area making huge improvements over last year. The Douglas Freeman defense held Atlee to just two touchdowns as the Rebels pulled away with a 24-14 win to go to 3-0 for the first time since the 1990's, a minimum of 15 years....the Raiders come back home next Friday to face 3-0 Henrico, whose offense can strike quickly. Suddenly, another tough test for a Raiders squad whose offense has regressed the last two weeks after that 70-point performance on opening night. The Raiders were without lineman Austin Cannon and wideouts Ross Gardner and Booth Watson, all out due to injuries. They probably won't be available for the Henrico game either, making it all the more important for McCoy, Dandridge, Stubbs, Carey, etc to step up their games individually if the Raiders want to be 3-1 going into Hanover week. 1) Sam Rogers and Virginia Tech welcome Marshall at 12noon at Lane Stadium, while Karlie Suber helps the UVa Women's Volleyball team in a weekend tourney in Charlottesville. They'll play William & Mary at 7pm. 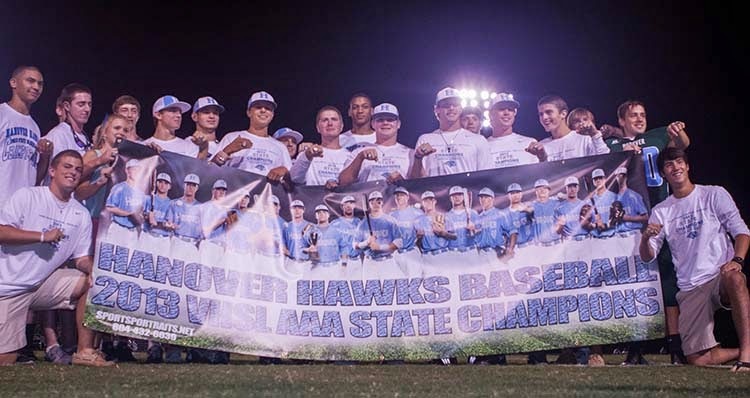 @Hanoversports plans to be at both events on Saturday, as we work on a series for the Hanover Herald-Progress on multiple county freshmen already making their mark on the college level. 2) THANK YOU!!!! Our halftime fundraiser for the American Heart Association's Richmond HeartWalk raised an amazing $341!!!! CLICK HERE for all the details about the HCS Team walking next Saturday, and, if you haven't given a donation, we'd love for you to do so! Just click the "Give Now" button!! 3) Don't miss "Central Region LIVE! 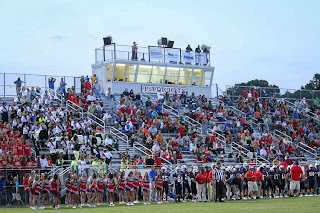 ", Richmond's ONLY LIVE call-in radio show dedicated to high school sports, Monday night at 7pm on WHAN, 102.9 FM/1430 AM. Guests include Marc Davis of @NBC12 and Highland Springs head coach Loren Johnson! Join us before you watch #MNF!! FIELD HOCKEY: Sophomore Sydney Baldwin had a penalty stroke goal and an assist to pace Atlee to a 3-2 win at Patrick Henry, advancing the Raiders' record to 6-2. Brooke Flexon and Ashley Samuels tallied for the Patriots, who fell to 3-4. Lee-Davis had a sweep victory of their own tonight over Varina, as Chelsea Matthews helped herself to 6 kills and 5 digs while Anna Soroka added 15 assists. the Confederates move to 7-4...and in a titanic battle to a five-set tiebreaker, Patrick Henry outlasted Hermitage, 25-11, 22-25, 16-25, 25-21, 15-13. Laura Williams' 35 assists and 5 kills paced the Patriots (4-3). BOYS VOLLEYBALL: A five-set showdown for Atlee and Hanover, and, as in the girls match, the visitors were victorious. Hanover (3-2) knocks off Atlee (4-7) 25-15, 25-22, 25-27, 17-25, 15-12. Giles Vanhuss paced Hanover with 33 assists and 10 blocks, while Drew Hazelgrove had 11 kills, 10 digs, and 5 aces. Eric Rohr led Atlee with 10 digs, 9 kills and 6 aces, while Jeremy Eye had 16 kills on the night, as did Hanover's John Atwood. Life was much easier for Patrick Henry, as they swept Hermitage 25-19, 25-20, 25-15. Will Burch led the Patriots (6-4) with 2 kills and 3 digs while Wood McIlhenny had 8 kills. GOLF: Atlee takes a victory at Queensfield today, defeating Hanover and host Lee-Davis. The Raiders shot a 161, the Hawks a 174, and the Confederates a 179. Leaders for each team were Phillip Sening, the medalist at 37, Ward Wilkinson for Hanover at 41 and Austin Diehr for L-D with a 42. --The 55th Tomato Bowl sees Lee-Davis at Patrick Henry, two teams needing a victory to avoid starting 0-3. LIVE coverage of the Tomato Bowl begins at 6:30pm on WHAN Radio, 102.9 FM, and online at the link at the top of this page! --Atlee travels for the first time this year, and they get Douglas Freeman, who they lost to 49-48 on a touchdown with 3 seconds left. 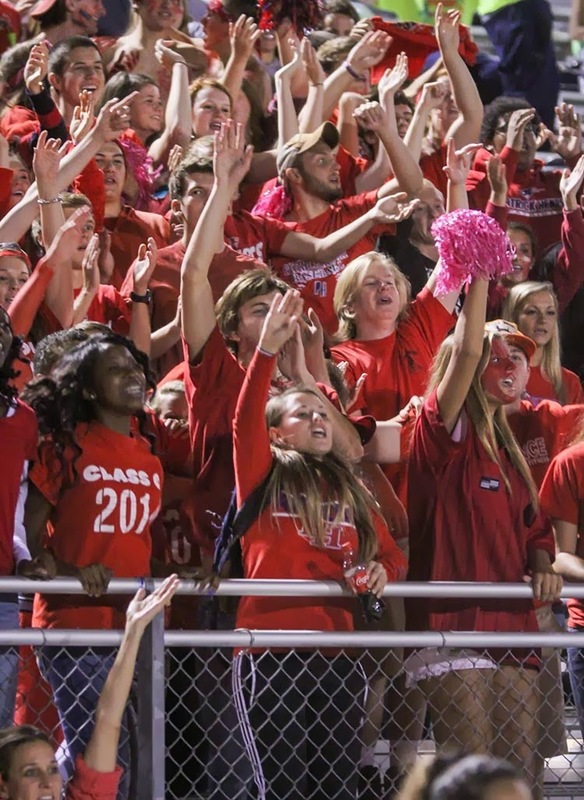 Both teams are 2-0 and a huge crowd is expected at William Long Stadium. Get there early for good parking. --Hanover travels down I-295 to the site of their 2012 Division 5 Regional Championship, rematching against Hopewell. The Blue Devils lost to Powhatan last week while Hanover is 2-0, coming off victories against Patrick Henry and JR Tucker. Hopewell will be a step up in competition before the Hawks host Highland Springs next Friday. 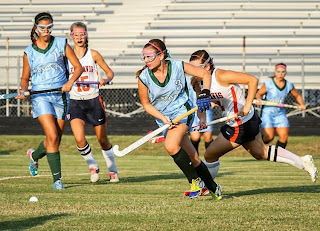 1) Atlee field hockey got back on track tonight with a convincing 7-1 win over Highland Springs. The Raiders improve their record to 5-2 overall and go to Patrick Henry on Thursday afternoon. 2) Lee-Davis boys volleyball handled Henrico on the road Wednesday evening in three sets, 25-14, 25-18, 25-19. Carson Caudell had 7 kills, 5 digs and 3 aces while Jordan Lafferty had 14 kills and 3 aces. 3) A new photo gallery of tonight's L-D/Henrico volleyball game is posted now on our Facebook page! 1) The Atlantic 10 Conference is expected to announce Thursday they will begin hosting their Women's Basketball Tournament at the Richmond Coliseum. The press conference is scheduled for 1pm in downtown Richmond, and HCS Media Network will be there for live coverage via Twitter and more. 2) Listen LIVE Thursday night to the Girls Volleyball showdown, as Atlee travels to Hanover to take on the Hawks! Our live online broadcast will begin around 6:55pm, pending the end of the JV match. 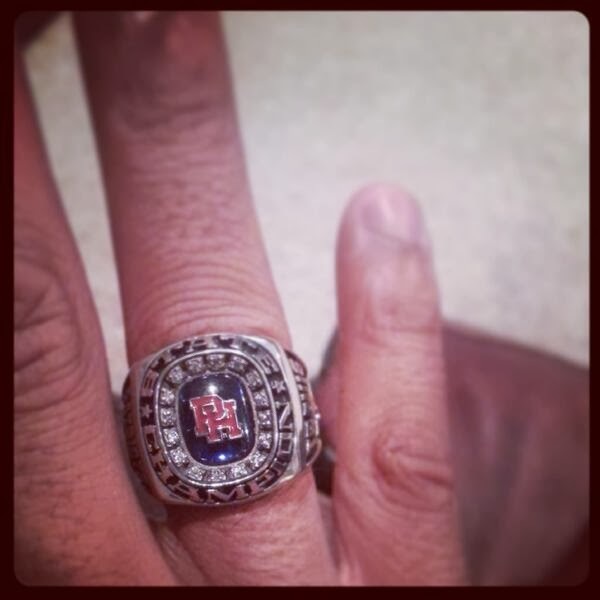 A link to the audio will be posted on the top of the page HERE and HanoverCountySports.net! 3) Thursday means JV football! 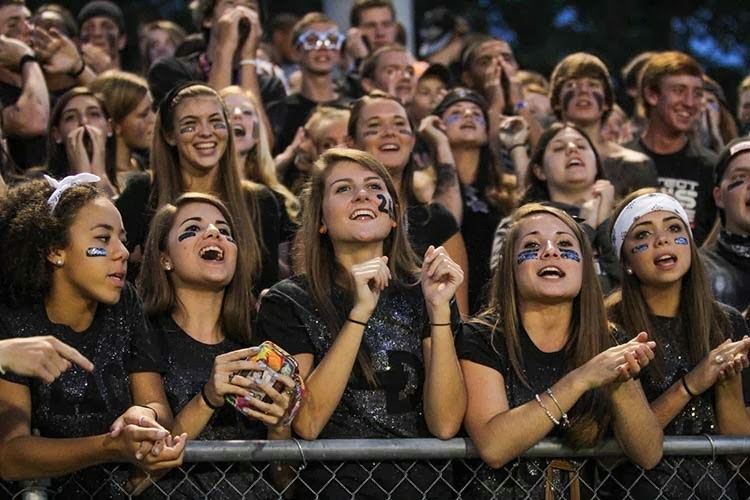 Hopewell comes to Hanover, Patrick Henry is at Lee-Davis, and Douglas Freeman comes to Atlee, all for 7pm kickoffs. Here's our schedule for the rest of September! Friday 9/20: The 55th Tomato Bowl: Lee-Davis at Patrick Henry, WHAN (102.9 FM/1430 AM) and online at HanoverCountySports.net! Friday 9/27: Football: Highland Springs at Hanover, WHAN (102.9 FM/1430 AM) and online at HanoverCountySports.net! Links to ALL HCS Media Network broadcasts will be posted at the top of this home page right here at HanoverCountySports.net and sent via Twitter (@hanoversports) multiple times the day of the game including just before broadcast start. 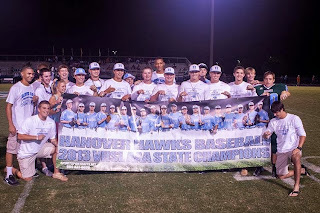 The Hanover baseball state championship team of 2013 returned to the Hawks Nest Friday night to receive their state title rings in a halftime ceremony during the Hawks' football home opener last night. A full report coming Saturday right here, and look for a Photo Gallery from the Atlee/Patrick Henry game on Saturday at Facebook.com/hanoversports! TOMORROW MORNING: We will LIVE tweet at the Pole Green Cross Country Classic, featuring Lee-Davis and Hanover! Join us, @hanoversports, for coverage after 8:30am! 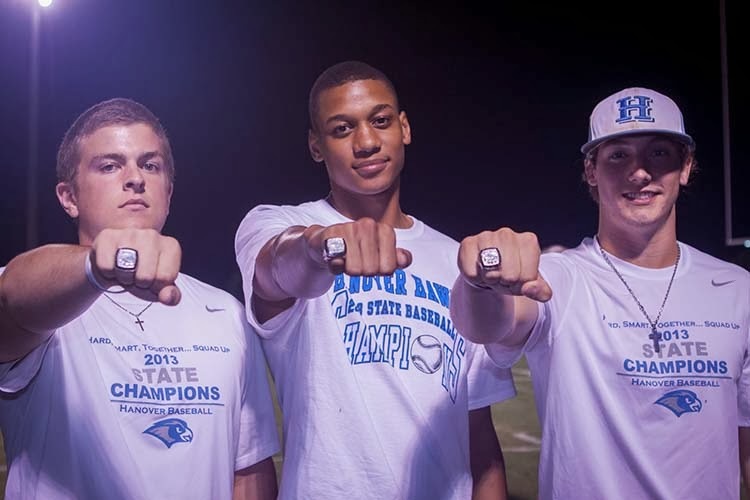 CLICK HERE to listen LIVE to Patrick Henry at Atlee, 6:30pm airtime with Rob Witham! The game is heard in the Richmond/Hanover area on WHAN, 102.9 FM and 1430 AM. GIVE TO HCS TEAM WALKING IN 2013 RICHMOND HEART WALK! It's just TWO weeks from tomorrow!! If you haven't done so, CLICK HERE to make a donation to the HCS Media Network team as we walk in the 2013 Richmond Heart Walk to benefit the American Heart Association, September 28th on Brown's Island! Read the personal story of Rob Witham, the "Hanover Sports Guy", who survived a major heart attack on April 8th to return to Twitter and the broadcast booth. Then support his survivor's walk by clicking on the "GIVE NOW" button to the right! ANY amount is welcomed and VERY much appreciated! OH, if you don't have a credit/debit card or Paypal or wish to give a donation in person, see Rob or his daughter Rachel, TONIGHT at the Patrick Henry/Atlee football game, next Friday at the Tomato Bowl, or September 27th at Hanover when the Hawks face Highland Springs! Make checks payable to American Heart Association. 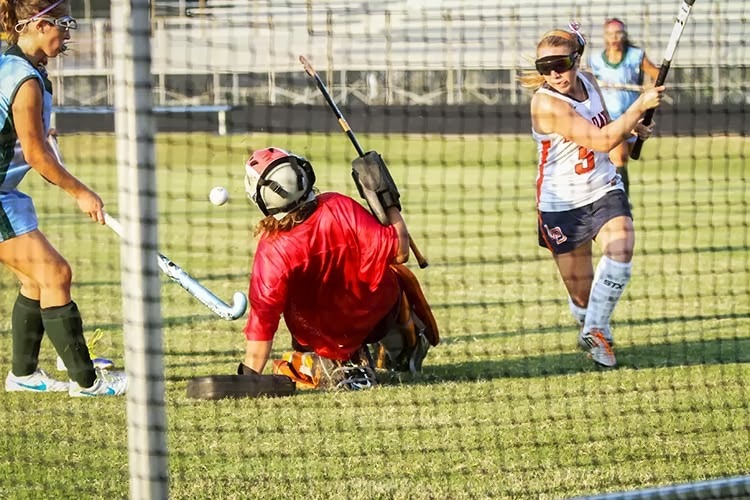 Listen LIVE to Hanover/Lee-Davis Field Hockey TONIGHT HERE!!!! CLICK HERE to listen to tonight's showdown between Hanover and Lee-Davis in field hockey action! Rob Witham brings you the call starting at 5:55pm! CLICK HERE to either join our HCS Media Network team to raise money or, if you can't join us, please DONATE to help us help the American Heart Association at the 2013 Richmond Heart Walk on September 28th on Brown's Island!! To read the personal story of Rob Witham, the "Hanover Sports Guy" who will walk with the Survivors Mile on 9/28 as captain of the HCS team, and how he survived a heart attack, CLICK HERE! Our goal is $2,000 and we have under three weeks to raise it, but we know we can thanks to you!!! The Hawks scored on their opening possession and never allowed a point, defeating Patrick Henry 22-0 in Ashland on opening night, Hanover's eight consecutive victory over the Patriots. New quarterback Korbin Bordonie went 11-of-20 for 130 yards and 2 touchdowns, including a 9-yard strike to Brennan Gary. Chesdin Harrington, subbing for the injured Tyler Phelps at quarterback for PH, completed his first seven passes, but didn't complete a pass in the second half. Phelps was out with a sprained ankle and is expected to return next week at Atlee. Brooks Coombs was the star of the game, rushing 19 times for 134 yards and an insurance touchdown, the only score of the second half. Meanwhile, the Atlee Raiders picked up right where they left off offensively, as a new cast emerged in a 70-14 rout of Deep Run. It was 49-7 by halftime. The game was over almost before it started. Now Patrick Henry must travel to face and find an answer for Atlee next Friday night. That's our "Game of the Week" on WHAN, 102.9 FM, 1430 AM and here at HanoverCountySports.net. CLICK HERE to listen LIVE to our Game of the Week, Hanover at Patrick Henry, beginning at 6:30pm! The game is heard in the Hanover/Richmond area on WHAN, 102.9 FM and 1430 AM!! 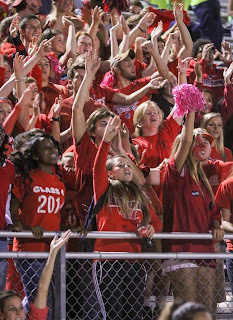 Week 1 of the 2013 high school football season is here! The schools in Hanover County begin their season tonight after many schools in the area began before Labor Day. Listen to tonight's game, follow us on Twitter @hanoversports for live tweeting and score updates from across Central Virginia!!! Don't miss the premiere of "Central Region LIVE!" tonight at 7pm on WHAN, 102.9 FM and 1430 AM! Host Rob Witham will review Labor Day Weekend action, preview the official "Week 1" of the 2013 regular season, talk with Marc Davis of NBC12 and have exclusive interviews with new Hanover head coach Derek Stoudt and new Patrick Henry head coach Jonathan Clark ahead of their showdown on Friday night to be heard on WHAN!